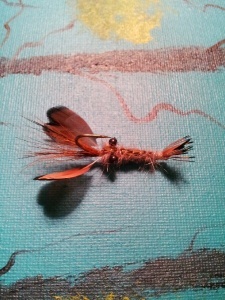 Realistic crawdad fly tied for my smallmouth bass streams here in NorthWest Arkansas.U.S. This is a crawdad pattern that utilizes a hook that rides hook point up, which is generally used for soft plastics and gear, to achieve weedlessness. Fish this in the summer time for smallies.